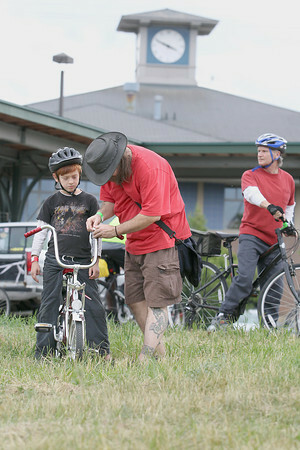 John Hansen (cq) of Traverse City helps his son Owen Hansen (cq), 9, prepare his bike for Friday's Tour de TART at the old train depot in Traverse City. Riders braved overcast skies and rain for the 13th annual ride from Traverse City to Suttons Bay along the TART and Leelanau Trails. Proceeds from the 19 mile recreational ride al benefit TART Trails.